Even as banks are on an overdrive to push customers to link their Aadhaar numbers to bank accounts on the threat of suspending accounts, the Reserve Bank of India (RBI) has told us that it has never issued any such directions. This was in response to a Right to Information (RTI) Act application filed by me. The RBI’s emphatic RTI response makes it clear that the decision is entirely that of the central government. The RBI’s response says, “The Government has issued a Gazette Notification GSR 538(E) dated 1 June 2017 regarding Prevention of Money laundering (Maintenance of Records) Second Amendment Rules, 2017, inter-alia, making furnishing of Aadhaar (for those individuals who are eligible to be enrolled for Aadhaar) and permanent number (PAN) mandatory for opening a bank account. It may be noted that Reserve Bank has not yet issued instruction in this regard”. Replies from RBI clearly show that it is the Narendra Modi-led National Democratic Alliance (NDA) government, which is frightening and coercing people into linking bank accounts with Aadhaar, under the pretext of preventing money laundering. This reasoning is quite bizarre because it seems to treat every bank customer as money launderer and criminal involved in money laundering, unless they link their Aadhaar number with bank account. Experts have questioned the legal validity of this action and even moved the Supreme Court alleging contempt of its orders. The SC has restricted usage of Aadhaar to six schemes, where the government is providing some benefits or subsidy to individuals. Earlier, the RBI itself had raised serious concerns on Aadhaar in terms of terror financing and money laundering before reluctantly agreeing to the use of the UID in 2011. The Gazette Notification issued by Department of Revenue under the Ministry of Finance, for mandatory linking of bank accounts and Aadhaar number is in contravention of the Aadhaar Act. Especially, Section 7 of the Aadhaar Act states furnishing of Aadhaar to establish identity for receipt of subsidy, benefit or service for which expenditure is incurred from Consolidated Fund of India. An individual bank customer, in most cases, uses own money to open or operate the account and not from the Consolidated Fund of India. Also there are a large number of taxpayers, who are not even eligible to receive any subsidy or benefits from any Central Ministry or State Government. Yet, they too are forced to link their self-financed bank account with Aadhaar number. One circular (No 23111/Gen/2017/Legal-UIDAI dated 15 September 2016) issued by Ajay Bhushan Pandey, Chief Executive of UIDAI about Section 7 says the Central Ministries or State Governments, who wants to use Aadhaar should issue a notification stating the service, benefits or subsidies from the Consolidated Fund of India, which require the beneficiary’s Aadhaar authentication or furnishing proof of Aadhaar. (See image below). Linking a bank account with an Aadhaar number has no advantage either to the bank or the customer. This is because the customer’s PAN number, which has been issued by the Income Tax Department, is already linked to majority bank accounts. The PAN number actually provides much more information than the Aadhaar number and is linked with all financial instruments of the banks’ customers. In addition, banks are mandated to strictly follow know-your-customer (KYC) procedure for all its customers. For KYC, the RBI considers passport, driving licence, PAN card, Voter’s ID card issued by the Election Commission of India, job card issued by NREGA duly signed by an officer of the State Government, and letter issued by the Unique Identification Authority of India (UIDAI) containing details of name, address and Aadhaar number as six officially valid documents (OVDs). Explaining the OVDs, RBI says, customers, at their option, can submit one of the six OVDs for proof of identity and proof of address. What is more serious in this mandatory linkage business is the Government thinking and treatment to every bank customer as money launderer without Aadhaar. That too when the Government machinery has several tools at their disposable to identify any bank account that is used for money laundering purpose. One such tool used by the Income Tax Department is procuring statement of financial transaction or reportable account (FTRA), previously called as Annual Information Return (AIR). Under FTRA, banks had to furnish information on cash deposits or cash withdrawals (including through bearer’s cheque) aggregating to Rs50,000 or more in a financial year, in or from one or more current account of a person. Additionally, post offices, NBFCs, companies, mutual funds, registrars or sub-registrars, Regional Transport Officers (RTOs), District Collectors and stock exchanges also have to submit high value transactions to the I-T Department. If the government has all tools and capability to identity money laundering taking place in bank accounts, why then it is forcing each and every account holder to link Aadhaar, which is illegal as it contravenes the Supreme Court orders. One Dr Kalyani Menon Sen had already filed a petition in the Supreme Court against mandatory linking of Aadhaar with bank accounts and mobile numbers, says a report from The Hindu. 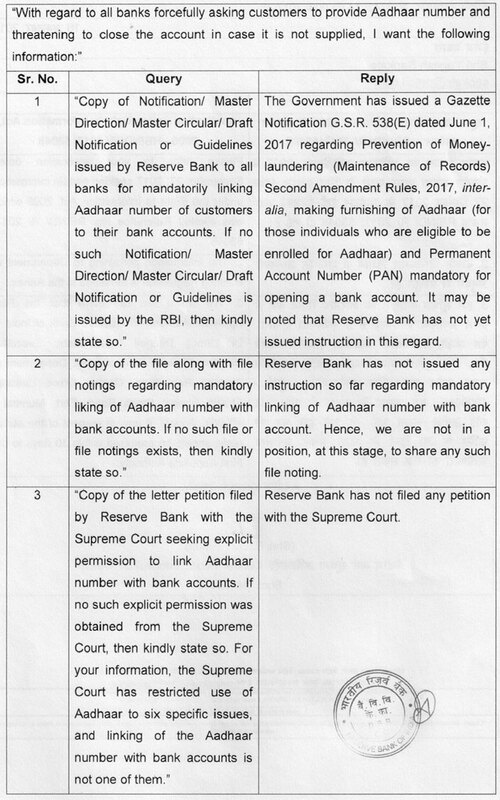 The petition challenges Rule 2(b) of the Prevention of Money-laundering (Maintenance of Records) Second Amendment Rules, 2017 for mandatory submission of Aadhaar number for individual clients, companies, partnership firms and trusts for opening of bank accounts, maintaining existing bank accounts, making financial transactions of and above Rs50,000 and crediting foreign remittance into ‘small accounts’. The petition says the Government’s move to link bank accounts and mobile numbers with Aadhaar number violates fundamental Right to Privacy and equates citizens, including the elderly, women and students, with money launders. The apex court is scheduled to hear several linked cases on Aadhaar in November. Hope it considers this forceful linking of bank account with Aadhaar number as well. Yes RBI should intervene. I have been getting three sms s a day from my bankers, and three from all my mobile operators. Dr Anupam Saraph ( I hope I got his name right) has to be appreciated for preparing Letter in my defence and yours, if the letters are submitted to the concern addressees. I will be submitting mine tomorrow as the Divali Week has come to an end. Also TOI reports of a connected Petition filed before the Supreme Court. Govt “Arrogance” is the word used by the writer of today lead article in the time of India . I have forgotten. how much does a Aadhaar Card cost to make? or rather what is the cost of a Aadhaar Card to the Govt? was it Rs150/- or Rs 200/-, the govt claims that 153 crores people have registered or taken a Aadhaar Card ( it is still Voluntarily if you check the Unique Identification Authority of India (UIDAI) website) Rs 200 per card into 153 crores is a lot of money passing hands between Elected Politician officials of this Central Govt and the Last Govt, Public servants too are all hooting for your Rs 200/-. The Former Unique Identification Authority of India (UIDAI) MD & Chairman has retired to the USA I think he is no mare a Politician. We Senior Citizen are having sleepless nights not knowing what is your financial position when you get up in the morning? will all your Fixed Deposit and Bank account vanished and belong to your trusted Bankers? will your SOS people and Family be cut off as your cellular services are cut off? I have been disturbed the past few months, it is mental torture. First It was Demonetization now this.